A steampunk novel deconstructed into 10 short stories by Daren Callow - available now for the electro-book-o-graph, Kindle and other similarly modern devices or as a paperback book, with real paper. Suitable for adults and older children alike, these stories are great fun in the mould of Terry Pratchett's Discworld or Douglas Adam's Hitchhiker's Guide To The Galaxy. For extracts from stories and more about the author check out my Blog. For all correspondence: contributions, booking live performances and franchise opportunities for the stories or podcast please write to us at: letters@talesofnewalbion.com including a self addressed envelope (or your electronic mailing address) if you wish to receive a reply. 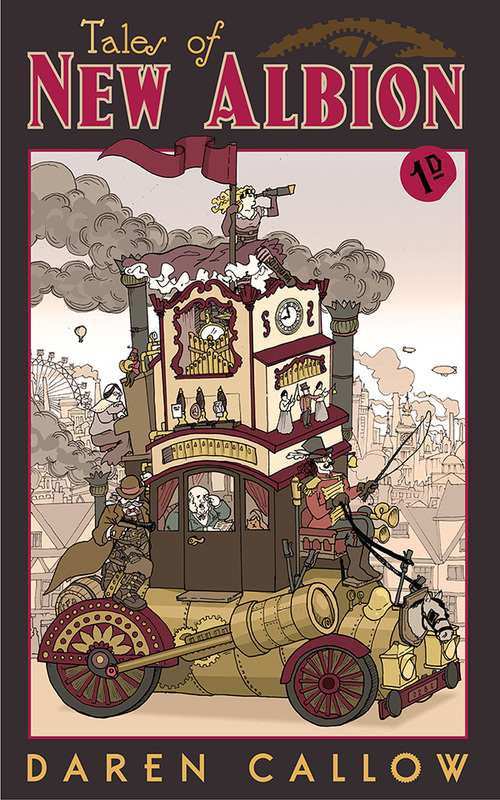 "I've slowly found myself getting interested in the whole Steam Punk world, a cross of my 2 favourite things- inventions and the Victorian era, so I thought I'd give this book a go. Its terrific, I've only read the first 2 stories so far, but have loved it. The first story I can easily see as a short film." "I have to be honest and say I am a newbie to steam punk, but what an introduction! After a recommendation from a friend, I bought these short stories and they are brilliant. Entertaining, funny and sometimes downright bonkers, they transport you to another world! I particularly enjoyed the High Cliffs Tea Rooms and the strong female characters. Buy it, enjoy it and try to catch a live reading too!" "Daren Callow has delighted Steampunk audiences with his wonderful characters and stories at numerous events up and down the country - I am very excited about this collection of short Steampunk stories! Recommended." "I have never known a set of Steampunk Short Stories by a debut author to be so professionally produced and perfectly illustrated. The writing has clearly been a labour of love, and I can honestly say I've never read a better Steampunk Story in my life. Stupendous." "It was a great story. Made even better by your superb delivery. I thoroughly enjoyed it." "They are all great fun and I found myself speed-reading them as I wanted to find out what was going to happen!" "This is a terrific set of stories. New Albion is an engaging and riveting world, brought vividly to life by complex characters and thrilling plots. The twists and turns kept me enthralled. More please of the gutsy heroines, sparkling dialogue and pacy stories."